When I first read the synopsis of Velvet it was a blast, from the 2008, past. A YA vampire story complete with an attractive vampire hero that can go out during the day, romance, and a chilly climate. This novel had all the trappings of a Twlight-wannabe. Luckily Temple West realized this and played on the humor of the situation, writing something fun and compulsively readable, if not wholly original. 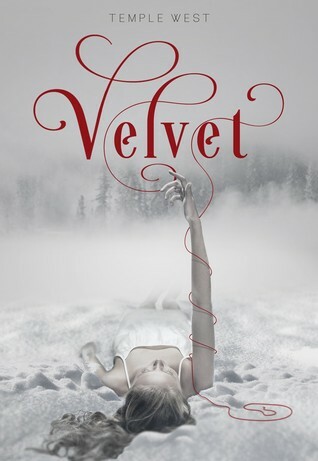 Velvet follows Caitlin Holte after her life is turned upside down following the death of her mother. Caitlin is forced to move to a painfully small town and live with her Aunt, Uncle, and Cousin. While out in the woods, trying to grieve her mother and the loss of her former life, Caitlin stumbles on a demon of sorts and on to Adrian. In order to keep Caitlin protected from the demon, now bent on her demise, she has to fake date Adrian. Soon though the line between fake date and real date start to blur. By far my favorite thing about this novel was the characters. I couldn’t help but like Caitlin. Her grief felt real and I liked her quick, witty, banter with Adrian. Temple West’s writing was genuinely funny without feeling forced. My only qualm with Velvet was that there were a lot of questions posed and not a whole lot of answers. I wished the ending had given me that nice finished feeling, but, after that ending, I have a feeling this is going to be a series. Overall, I enjoyed Velvet. It was a throw back to the bygone days of teenage vampire books. Velvet was able to distinguish itself from the many other books in that genre with its witty writing and quick moving plot. I’m looking forward to reading more from this author! Oh wow! I'm genuinely surprised. I read the back too and thought "uh...isn't that said and done already?" Good to know it can stand out on its own. I really want to read this! It has a beautiful cover for starters, and seeing as this is my kind of book it is also a given. A lot of people are saying it is too similar to Twillight. I love that book and it would be a shame if it was because when books are too similar I end up disliking the one that came later.